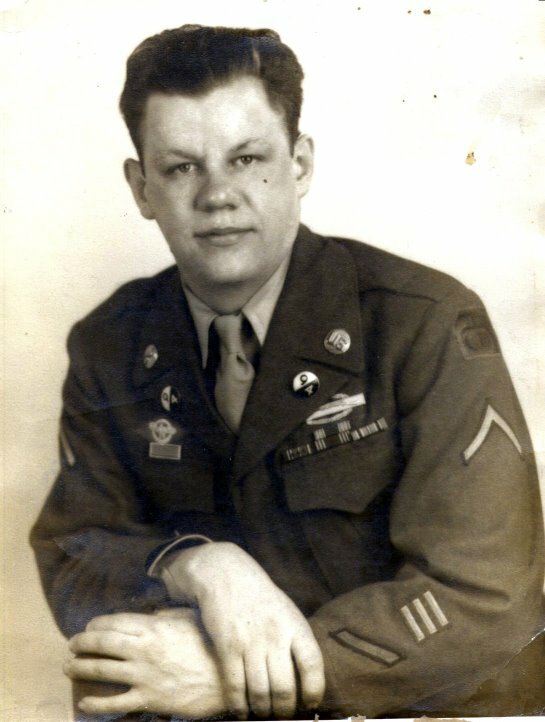 My father, Joseph W. Turek, Sr., 94th Infantry Division, 94th Infantry Regiment, 302nd Infantry, 302d Medical Detachment, Cannon Company, on 21 Dec 2010, was awarded the Combat Medical Badge and the Bronze Star Medal. I filled out the required paperwork and submitted it to the Records Center in St. Louis. I provided them with the necessary documentation. They found what they could after the fire destroyed most of it in 1973. They did find some of his pay records and it showed he was receiving combat pay. I am trying to find out information on a PFC that was killed on March 12th, 1945. His name id Ralph Allen and we was the brother of my Grandfather. He was a soldier in the HQ CO. 376th Infantry. If anyone know more of this man please let me know, or point me to a source that can provide me with some details. Ideally I would like to know where he was killed and any circumstances that would be relevent. No one in my family knows anything other than he was KIA. Last Nov 2, I was elected to be a Representative to the New Hampshire State Legislature. Tony Rao the award of Chevalier in the French Legion of Honor. I was present at the award ceremony, and I spoke. My grandfather was in company M of the 376th infantry regiment. His name was Albert Cuomo. I am searching to see if there are any surviving members of company m, or if anyone in the 376th remembers him. He was listed as a heavy machine gunner on his discharge papers. I would like to tell a huge "Thank you!" to all the Veterans of 301 Infantry Regiment (Particularly Co. K) and 301 FA Regiment, who answered to my request, via Larry SITNEY (The ATTACK), Tony LEONE, Bernard RADER and Al PRINCE. Thanks to their invaluable help, the town of ETEL (Brittany) will be able to pay a tribute and honor the memories of three young men who joined in death on December 8th 1944, in the sands of ETEL, Lt Thomas J. LEONE and Sergeant Loray E. THORNTON, KIA on December 4th 1944. I had been put in charge, since I have some English, to gather every piece of information available..., and my task is now over. will be honored and remembered by the community of ETEL in a forthcoming ceremony. My grandfather, Angus Gillis, from Massachusetts served in the 302nd Infantry Regiment, 94th Infantry Division. He died 4/19/1945. His military records were destroyed in the St Louis fire. I am looking for anyone who knew him or anyone who has any information. I am looking for any information about S/Sgt. Joseph Pinchot, service # 35719210, from Terre Haute, Indiana. Joseph Pinchot was in the 94th Infantry Division of the 302nd Infantry Regiment. He was killed in action somewhere in Germany on January 28th, 1945. From: "Millner, Rodney, Mr., CIV, OSD-DPMO"
My name is Rodney Millner. I am a research analyst for the Department of Defense, Defense POW/Missing Personnel Office (DPMO). I came across your website during an internet search. We want to inform veterans that The Defense POW/Missing Personnel Office (DPMO) is upgrading its efforts to recover the remains of soldiers still missing from WWII. While we have always worked the WWII issue, we recently created a new WWII Division to increase the attention given to this period. As part of this effort, we would like to speak with any WWII vets who may have information that could shed light on the loss/death of a fellow serviceman whose remains might not have been recovered. Veterans who have such information are encouraged to contact DPMO with any knowledge that could lead to the recovery of that soldiers remains. Also, relatives or friends who may have such information (from conversations with WWII vets, personal records, diaries, or other documents they may have) are also asked to call. We would appreciate it if you could pass this on to your membership. Thank you very much for your help. Does anyone have information on my dad, Forrest Fuller. He was in the Battle of the Bulge in this division. He was very young. We have never known anything about his service. He died in 1960. I am helping a close friend of mine and his wife (David and Karen Krause) in researching David’s father’s (Raymond J. Krause) military records and history. Unfortunately, we were informed by the National Personnel Records Center that most records were destroyed by a fire. However, we have been able to locate several documents – one in particular, was Raymond’s Honorable Discharge (although of poor quality, please see attached) that noted he was assigned to 301st Infantry Regiment, CO I, 94th Division where he served as a Surgical Technician 861 – TEC 4). 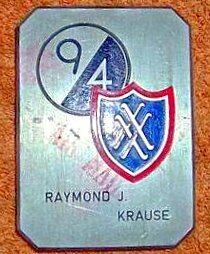 Raymond Krause died in May of 2002 and attached are two Obituaries that were published. The Krause family is looking to accurately document their Dad’s military service and any information the Association can provide and/or recommended courses of action would be greatly appreciated. I recommended that David and Karen contact the Association, and hopefully you will hear from them soon. Raymond Krause, a general and vascular surgeon so respected that other doctors trusted him with the care of their families, died Sunday. The Westwood resident was 80. As a surgeon, he pioneered the use of the Fogarty balloon catheter and the atraumatic arterial clamp, both now used worldwide. As director of medical research at Good Samaritan Hospital, he helped develop chemotherapy as a treatment for cancerous tumors. By the time the first oncologist came to Cincinnati, Dr. Krause's practice had a large group of cancer patients, which he turned over to the new specialist. Dr. Krause, a surgeon on staff at both Good Samaritan and the old St. Francis-St. George (now Mercy Franciscan- Western Hills) hospitals, died at Hospice of Cincinnati from complications of Parkinson's disease. A native of Columbus, he was a student at Ohio State University when World War II interrupted his education. He became an Army infantryman and survived the invasion of Normandy and the Battle of the Bulge. He returned to Ohio State, and using the GI Bill, graduated from its medical school. After serving an internship at the U.S. Naval Hospital in San Diego, he spent a year in general practice in Harlan, Ky. In 1951 he entered a general surgical residency at Good Samaritan Hospital. That, too, was interrupted by war when Dr. Krause accepted a call to serve as a surgeon with the 1st Marine Division in Korea. “He served three times the length of the usual rotation for surgeons assigned to the front lines,” said Dr. John J. Cranley, his friend and colleague. Dr. Krause worked with Cranley Surgical Associates until his retirement in the early 1990s. He routinely stepped into the most complicated surgeries. I am seeking information regarding the WWII history of my dad, William (Bill) Hollis King 01323714. His documentation showed that one of his purple hearts, a bronze star, and a CI badge were obtained while with the 94th. Unfortunately, when I requested more detail from the Kansas City Records center, I was told of a fire destroyed most of their records in the 1950s. I discovered your web site that mentioned a Lt. King during the battle of Wise, but no further detail was given. That is all I have been able to find. Some of his awards show GO 335 Hq 22 Sep 44, GO 12 Hq 376th inf 1944, and GO 117 Hq 94th 1945, and Go3 106th hosp when he was wounded the first time. I also remember stories about hedge rows, attacking a row of pill boxes, and liberating a concentration camp. Do you have any other information that might tell me if he is the same King that you have listed, and anything that might indicate where he was and what citations he may have gotten to receive the medals. If it helps, I have attached the names of men who served with him at some point. Some may be misspelled as I copied them from a captured Nazi flag. PFC John C. Greene, RT 1 Marietta, GA.
PFC Enoris T. Metiviar, 1377 Harvey, ST, Cambridge, MA. T/Sgt. 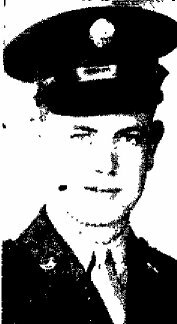 Loren Wilms, Torrington, CT.
PFC Clayton Butler, Box 1736, Bridgeport Ct.
PFC Melvin B. Newsbaum, 6416 San Bonita Av, Clayton 5, MO. PFC Clyde E. Miller, Gen, Del, South Connellsville, Pen. T/S Emil J. Viatour, 1655 Michigan St, Toledo OH. PFC Philip Martino, Waterberry, CN. Tenon Harbach, 223 W. 42nd Place, Los Angeles, CA. PFC Joseph F. Sickler, Falls, PA.
Capt Hank Bowden, Raleigh, NC. Pvt Harold L. Martin Rt3, Liberty, MO. I am a french collector/historian of ww1 and ww2, especially interested in North-East France Campaign. 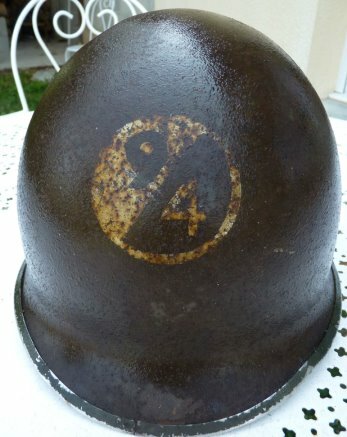 I just found this helmet with the 94th division insignia painted on front ( see attached picture). I would like to know more of this insignia on helmet ; do you know when it was painted on helmets ? In France or in Germany when the war was over ? Do you own original photographs with this insignia on helmets ? Congrats for your nice internet site. Very interesting. My father served with the 94ID during WW2. He died in 1990 and unfortunately I do not know what unit he was assigned to during the war. His name was Edward S. Wojtal, 1LT Infantry, hometown Albany NY. He started out as a rifle platoon leader and ended as a weapons platoon leader. Where can I go to find out what unit he was assigned to? Looking for a Class A Pilgrim patch for a shadow box. Do you know of a source? Came across this site and noticed my fathers name in taps. it did not list home town Providence, R.I. or his unit ???? if anyone has a memory/story about Kenneth Oxley, I would be thrilled to hear about it. my name is Jaromir. I am from Czech Republic/Europe (during WW2 Czechoslovakia). I am keen on 94th ID in WW2. I admire this significant part of the US Army. 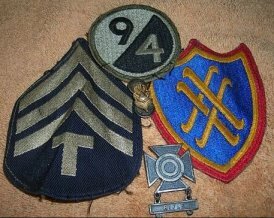 I collect all what is adherent to the 94th ID in WW2 period. Currently I am looking for original of booklet "On the Way: The Story of the 94th Infantry Division". Is it chance to find this amazing booklet? Thank you very much for your tips. I have another request to you: Does anyone have any pictures in electronic form of the soldiers of the 94th ID. I will be very pleased if somebody send me some pictures to my email: j.janhuba@centrum.cz. Also if someone have any items of the soldiers of the 94th ID for sale, let me know, please. Thank you very much for your pertinent answers. Hello and Happy 4th of July!! I was wondering if anyone out there may have served and knew my father Walter J Pudelek (44-46) Company C 376th Infantry Regiment 94th Division. I knew he was stationed on Czech border after the war was over and was on a bus that crashed in Switzerland 1946? He may have played baseball or softball for the unit. Have pictures of him with Russian soldiers at the border, who my mother with her bad eyes confused them for Americans, and pictures of the bus crash. I would be interested in knowing if anyone out there knew my father. My fathers name was Clifford E. Morgan. The info I have on him says that he was (infantry) C-302, HQS DET 617TH QM BN 7TH ARMY. In the first photo, my dad is behind the car. In the second photo with 6 men, my father is bottom row to the left. I do not know who the other men are. My father has passed away and there is no way for me to find out. I have posted these photos on a few sites, but no one has responded. Hopefully someone sees a loved one and has yet another precious memory to hold on to. Pfc James J Siemer 35241141 killed in Keil Germany March 15,1945 and his good friend Bernard H Simpson 35241154 both killed the same day in the same battle they both graduated from Hughes High School in June 1945, they were both honor students, James was my brother, James was Catholic and Bernie was Jewish, and lived in Avondale, where his family had a dry cleaning shop. James lived in Corryville. I am looking for any information about my grandfather, PFC Donald J Heinen from Lima / Sheboygan Wisconsin. He was in the 94th Infantry Division of the 302nd Infantry Regiment. I do not know much more than this. He was Killed in action somewhere in Germany on January 28th, 1945 according to records. I do not know much about my grandfather, and there are not many of the family left to tell the tale. I was hoping someone would have any information for me. Any information at all would be useful, which company, where he was, etc. His records were destroyed in the infamous archive fire. I have attached an image from his obituary, sorry for the poor quality. My name is Stephen L. Gruebbel and my father, Earl R. Gruebbel, served in the 94th (Co D, 302nd). Father's Day was a recent trigger for me to go back over some of his military memorabilia and that prompted a visit to the 94th web site. I've also attached my favorite war time photo that dad had sent to my mom ... something I expect he provided so she could relate to some of the men he likely mentioned to her. It's a favorite because it's captioned with the date, place, and names of those included ... and because the names seem to me to reflect the diversity inherent in our great nation. I do recall, as a very young child (born in '48), hearing some of those names mentioned as I assume a few kept in touch. Of course, as time passed, everyone got on with their lives and that which they had in common faded into the past. Still, as I look back over this, and other, photos I can't help but feel proud and marvel at what they accomplished ... and wonder how many of them made it back. My father-in-law was a Polish prisoner in a Nazi work camp at Ohligs-Solingen. I believe that it was liberated by the 94th Infantry Division. I would be interested in any more information about this camp or the men who liberated it. My grandfather (Captain Cecil J. King) was a company commander for the 94th. He was in the group that liberated the Solingen Polish DR Camp 31/79 on the 16 of April, 1945, thus I believe that would place him in the 3rd Battallion. I don't have any other information about what group he was assigned to. Any help would be appreciated. My grandfather, Donald M Felver, served in the 301st company K in January and February 1945. He was KIA on February 24, 1945 in Serrig, Germany. I am requesting any information regarding this battle and the time leading up to his death. I have read the 94th Div book that was written from the daily reports. This gave me a time line, but was not very personable. If you may have known my grandfather I would really like to talk to you. Is there anyway I could get the hometown of L.B. Brandt #36612480 KIA 9/11/1944? My dad (Berdell A. Lucht) was with him when he got killed and I'd like to visit his gravesite to pay my respects. Thank you for any help you can give me. We should encourage vets to find someone to do their oral history, and encourage anyone who knows a vet to take their oral history and send it to the Library of Congress for permanent archiving. I was fortunate enough to complete a video interview with my wife's uncle, who was a radio operator/gunner on B-24's in the Pacific for the 494th Bomb Group (Heavy). 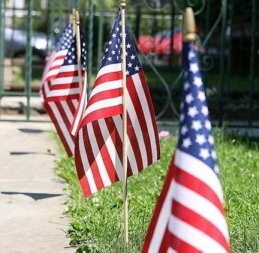 Hoboken will hold its annual Memorial Day Parade this Wednesday at 7 p.m., just days before the holiday weekend. The Hoboken Joint Memorial Committee puts on the event, which starts at City Hall, 94 Washington St., and heads up to Elks Club, 1005 Washington St. 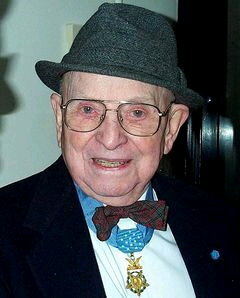 This year, 13 Medal of Honor winners from Hudson County will be honored, including the county’s only living recipient Nicholas Oresko, 93, formerly of Bayonne. In World War II, Oresko served as a master sergeant in Germany and single-handedly defeated a German bunker, was seriously injured and destroyed a second bunker despite his injuries. “We’re honoring Hudson County residents who were decorated with an honor that not too many people received,” said John Carey, parade coordinator. Veteran Tom Hickey, of Hoboken, will also be honored with a plaque for having served in the American Legion. The Hoboken parade is 112 years old and has been continuous annually for the past 88 years, Carey said. Among the bands marching are the Bayonne High School band, Xavier High School ROTC from New York City, the Port Authority marching band of New York, and the Hoboken Rockin’ Red Wings. just days before the holiday weekend. 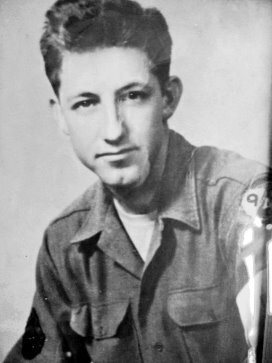 Subject: Robert Van Houten--Wanting to contact anyone who knew my father, Robert Van Houten, raised in NY City (Bronx), who fought in the 94th Infantry Division in the Battle of the Bulge. Yesterday, I was talking to my father via phone, and he talked very briefly about an experience in Czechoslovakia. He also fought in Germany and Belgium. Although he does not own a computer, I thought it would be nice if I could find someone who might have known and served with him during 1944-45 and perhaps get them in touch with him. He is now 88 years of age and in moderate health, and living in Greenville, SC. I’m not sure I will hear from anyone, as his friends are up in age, but if you have any info, I can be contacted below. My Uncle served in the 94th Infantry Division until his discharge in 1945. A couple months later he was killed in an auto accident. While I know his last name was "Sherman", I do not know his first or middle name. I am doing ancestry research on our family. PFC Sherman was married to my Aunt who is now deceased. He had a child with her who bore his last name, but he is also deceased. I have a photo of PFC Sherman (attached) taken in his Army Uniform when he was discharged. Is there anyone in your organization who may have a roster of the 94th Division at the end of WWII that would enable me to learn his first name? Is there another source you could recommend for this purpose? 2) there were no antipersonnel mines in that field, and probably none in the nearby woods. So we attacked into the trees. Right, no mines. We soon came under fire from three pillboxes. 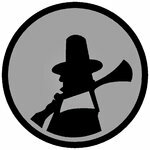 An artillery spotter called some coordinates, and WHOOPH, WHOOPH, WHOOPH. Three rounds which fell short, right over our heads. Our spotter's radio was hit, so not hearing corrections, they started firing for effect. It was a few minutes before they got the message to stop, but not before we took some casualties. We remained pinned down for several hours. Then, one enterprising buddy hollered,"Hey Hans. Wollen sie aufgeben? "- Hey Joe, do you want to surrender? It turned out they were just waiting to be asked politely. Two pillboxe raised white flags, but the third didn't. As soon as we tried to advance, they opened up on us. So we stayed there until nighfall. Then our captain radioed Battalion for orders. He was told to secure a large section of line. He told them his company was reduced to a squad, but he lied- we had at least 16 men. So we secured the 1500 yards anyway. In the morning, the 302nd attacked through us. Happy to report my Dad Dale L Reynolds is still alive and doing reasonably well at age 89. Also of note is that he and several other veterans of all wars have been invited to be on hand and treated as VIPs for a local “Farm League” Team in Salem Oregon, at the 4th of July Celebration featuring a game fireworks and recognition of all veterans. In the past week while cleaning up a few files around my Dad’s apartment, we found a scrap of paper with a roster of some of the squads in his old unit in the 94th. Wishing the best regards, and Thanks in advance for any information you might have. My grandfather was James Patrick Long and he was in the 94th Infantry. My mother recently gave me his journal but it was after he had been rescued and mostly spoke of the meals he was thankful to be having. I want to know more about what he went through and if anyone remembers him that I could speak to. He was from Kingston, NY, born November 28, 1913 and died on November 18, 1979. Could someone please let me know how to proceed? I know the rest of my family would love to know more about what our grandfather went through. He never spoke to anyone about what it was like over there so my mother and her siblings don't really know anything to tell us. I came across your news letter from the 1980's that was in our family tree history and luckily found that you had a whole website and our still meeting. I live in Washington, D.C. but am able to travel to NY or wherever. $2,190 PER PERSON sharing a twin or double room (single room supplement $485) AS LONG AS 20+ PAYING TOUR PARTICIPANTS. IF ONLY 15 - 19 PAYING TOUR PARTICIPANTS BY 60 DAYS PRIOR TO START OF TOUR, then the tour price goes up to $2,350 PER PERSON sharing a twin or double room (single room supplement $485) again, no flights included. A rare chance for veterans, family members and friends of the 94th Infantry Division to experience an in-depth visit to the 1945 battleground of the Saar-Moselle Triangle with Colonel Tony Le Tissier, author of "Patton's Pawns: The 94th Infantry Division at the Siegfried Line." Tony is a highly respected military author on World War II and Cold War Germany. Until retirement, he was an Allied military police colonel operating in Cold War Berlin and East Germany and also the last Allied Governor of Berlin Spandau Prison guarding Hitler's Deputy Rudolf Hess. Since retiring, he has devoted his professional military skills to military history research and writing. This tour was the idea of 94th Infantry Division Alliance member and veteran's grandson Dan Runde. He read Tony Le Tissier's book, was very impressed by his military knowledge, expertise and the thoroughness of his research and contacted him. 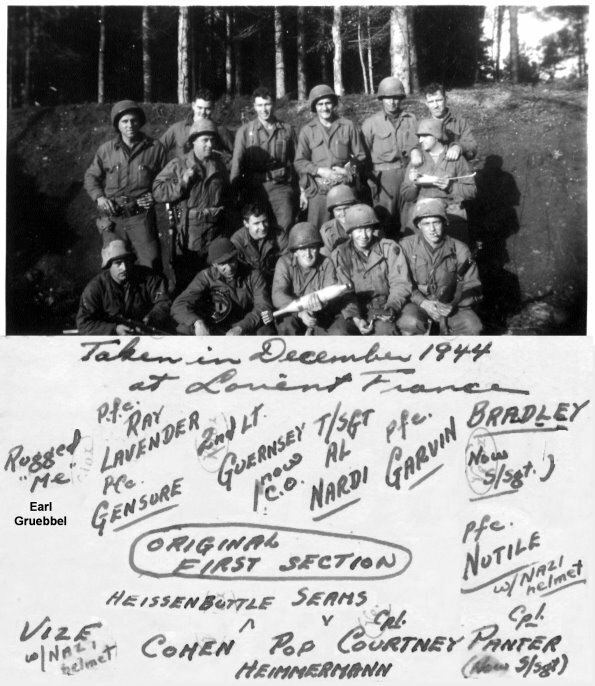 Tony Le Tissier writes, "After reading my book "Patton's Pawns: The 94th US Infantry Division at the Siegfried Line", Dan Runde asked me if I would be willing to take a 94th Infantry Division group around the Saar-Moselle Triangle. It was a pleasure for me to say yes. I have conducted three tours for 94th ID veterans in the past and I hope to meet old friends from the 94th again. I have asked Patrick Hinchy of MilSpec Tours to help me organize the tour. Patrick, a good friend, is an expert veterans tour organizer and guide in Europe, well known to many VBOB veterans. He will insure that we have an enjoyable and successful tour. We will spend three full days retracing the 94th's combat route in the critical Saar Moselle Triangle. The 94th US Infantry Division was one of the later formations raised in the Second World War, and consisted largely of draft-deferred students as enlisted men and an inexperienced officer corps pulled together from some domestic postings. It was initially employed in blocking the German installations in southern Brittany after D-Day. But when the Battle of the Bulge broke out, the 94th was hastily moved forward to cover the Orscholz Switch of the Siegfried Line between the Moselle and Saar Rivers. These two rivers and the Orscholz Switch formed the Saar-Moselle Triangle. Officially limited to battalion-sized operations, the 94th, now part of General Patton's Third Army, suffered heavy casualties, mainly because of the appalling weather conditions, but attributed by Patton to poor leadership. Patton then ordered an all-out assault. The Orscholz Switch was cracked with armored support and the 94th closed up to the main Siegfried Line facing it across the raging Saar River. This too was overcome, but at a considerable cost. The 94th was eventually able to break through and take the ancient city of Trier. However, it then had to stand up to a major German counterattack in the battle of Lampaden Ridge. The 94th only just defeated the enemy by its stubborn resistance, before sweeping on to final victory. The way through to the Rhine was open at last." You join the tour when you check into our Paris CDG airport hotel which is easy to get to from the airport terminals. Rest of the day free. Frequent 30 minute RER suburban train services to central Paris. You will receive full instructions about joining the tour in your Final Documents sent to you shortly before the tour begins. No included meals today since everyone will be arriving at different times. This morning Tony Le Tissier who is our guide throughout the tour, meets and greets everyone and and takes the group by coach from our Paris airport hotel across eastern France to Luxembourg City. Tony le Tissier says "Today we cover the area of the 94th's initial engagements and eventual penetration of the Orscholz Switch, that extension of the Siegfried Line covering the base of the Saar-Moselle Triangle, where the 94th was tasked with holding down the opposing German forces during the extremely bitter winter weather of January and early February 1945. We see remains of the formidable German fortifications,visiting in turn Perl, Tettingen/Butzdorf, Sinz, the 94th’s unique memorial, Oberleuken, Kampholz Woods, the German cemetery, Nennig and Thorn before returning to Luxembourg City." Patton is buried at the head of over 5,000 of his troops killed in the surrounding area. We then go on to view the spectacular terrain where the 94th broke through and crossed the raging Saar River to penetrate the Siegfried Line beyond, visiting Orscholz, Kirf, Freudenburg, Kastel-Staadt, Taben-Rodt, the Höckerberg (Hocker Hill), the Auf der Hütte cliffs, Serrig and Saarburg. We finish the day in ancient Roman Trier." Tony le Tissier says "Today we begin by tracing the fighting involved in breaching the Siegfried Line immediately beyond the Saar River at Ayl, Ockfen and Irsch, then visit the site of the Battle for Lampaden Ridge, where the 94th successfully withstood the attacks of the 6th SS Mountain Division. The concluding highlight of our in-depth visit to the Saar-Moselle Triangle is a festive reception and lunch with the people of Lampaden and perhaps some German veterans too. Then we return to Trier." Tony le Tissier says "This morning we drive from Trier via Echternach and the Sure River valley to Diekirch to visit the National Museum of Military History generally acknowledged to be the best Battle of the Bulge Museum. Then to Bastogne to visit the Mardasson Monument, the largest and most important American Battle of the Bulge Monument which features the 94th's insignia. Finally to the Belgian and European Union capital city Brussels for some free time and our Farewell Dinner." Easy independent transfer by train or taxi to Brussels BRU International Airport for return flights to USA. My dad, George Pappas, was in the 94th Infantry. He was in the Army between December, 1942 and February, 1946. He was in Europe but I'm not sure exactly when. My dad passed away in September 15, 2009, never having shared any information about his time in the service. I'm hoping that someone can provide some history regarding my dad. He had an American Service Medal, an European African Middle Eastern Service Medal, a Good Conduct Medal, and a WWII Victory Medal. I am seeking anyone who may have known my father Francis C. Bates. He was a warrant officer junior grade in the 376th and was awarded a Bronze Star for action at Tettingen Germany during February and March 1945. He was acting as the Regimental Supply Officer at the time. Looking for stories, photos, or anything that will help know a bit more about his service. 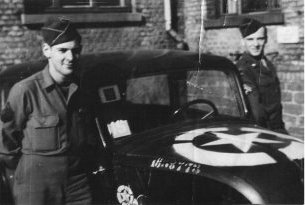 Dad never talked about the war, and even though I was stationed in Birkenfeld, Germany with the Air Force in the 70's he never said that the 94th had a command post there in 1945. Please send any information to Francis Bates at fcbates1@verizon.net. From: "Lloyd & Sheila Collier"
My Uncle Pvt RB Marshall Ser # 35844544 Was killed on Feb 23rd 1945 he was in the 94th Div. 376th Regiment I don't have Bn or Company. He must have completed Basic Training at Camp Croft, SC in the fall of 1944. His mother rec a letter from camp croft this was the last time he was heared from until his mothe was advised of his death. How can we get more informantion on him. my name is Jan Lakosil and I live in Czech Republic/Europe. My hobby is military history of Czechoslovakia before and post WW2. I have won sleeping bag last year, which was found in a small village near of Bavaria border. On this bag is name of his owner - 1st. 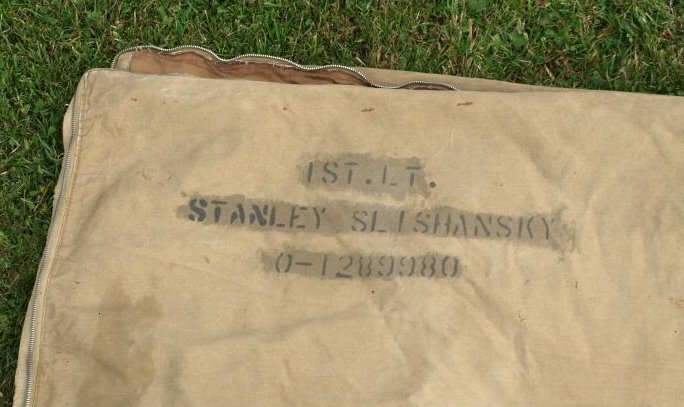 Lt. Stanley Slishansky and his personal number. I was very curious to know more about owner and to find contact to owner or his family. Unfornutanely I have found StanleyÂ´s name on list of killed soldiers (94th infantry division - 302th inf regt). Is it possible to find any further information, where was Stanley killed? Was he killed in Czechoslovakia or Germany? In attachment you find photos of StanleyÂ´s sleeping bag. 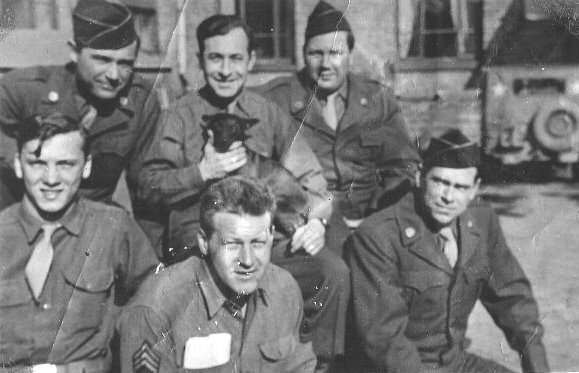 Another question - I look forward any photos of U.S. soldiers in Czechoslovakia - Sudetenland (border with Bavaria). Do you have any tips? My colleague have found nothing interesting in NARA. I will be very obligated, if you will find time for answer me. Thanks. Does anyone have memory of my uncle James "Jimmy" E. Riggan of the 301 First Artillery Division. He was KIA on Dec. 8, 1944 near Lorient. 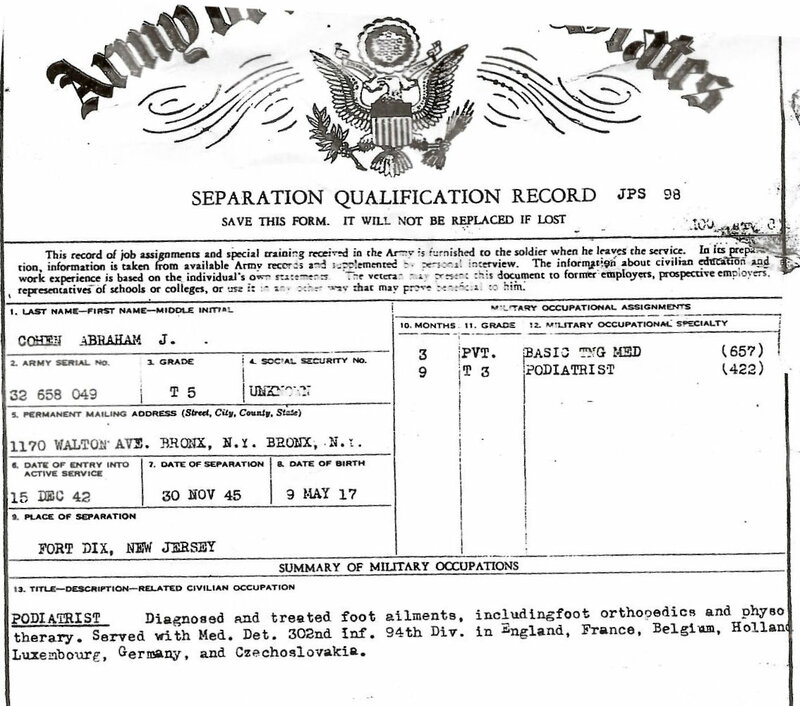 I am researching the war record of my father-in ­law Wilfred Fredriick Jennrich. All that I know is that he was a Captain and Infantry Unit Commander in Company E 302 Infantry 94th Division He entered the Army in 1941 and was discharged on March 24 1946. He never would talk the war, and since his passing the family would like learn more about how he served his country. If someone there could direct me to some agency where I could get this information I would appreciate it. I believe his service number was 01178844. My name is Jon Sackett. My grandfather was John “Jack” O’Neil of the 94th division. I was wondering the best way to get some information about his services during the war. When Jack was alive he rarely spoke of the war if at all. Once he passed I found a box with pictures, medals and other things pertaining to his time in Europe. I have many pictures of him and his fellow soldiers and would love to know who these men are!! Are there ever reunions? and if so are family member’s welcome? If you could e-mail men some info, I would be very grateful. I am trying to determine if the 94th Signal BATALLION not 94th Sig. Company was part of the 94th Inf. Div. I see a 94th Signal Co. listed. My grandfather was in the 94th Sig Bn and his unit action reports put him in the area of the 94th Inf. Div for most of the war. Any information or light you can shed on this would be appreciated. My father Henry"Hank" Kalette served in the 94th Signal Battalion in the Radio Platoon from May 1942 - May 1945 I believe. He was from Syracuse, NY and passed away Nov 2008. While in the service he wrote a history of the Radio Platoon titled "A Chronologically Documented Expostion Concerning the Transitory Nature of the Radio Platoon and the Personnel Therein or Tidbits About the Dit Dits. May 1942-May 1945." I have the first 7 and last pages of what appears to be a 30 page document. The rest are seeminly lost as he sent them to his parents ( my grandparents) but no one has them. I am hoping, one of you out there might have a copy. For a time he and my parents went to reunions and I think there was a Shantytown Newsletter. My parents corresponded with fellow servicemen and their families for many years and my mom may actually have sent a few letters this year. I would love to find the missing pages and anyone who knew him. I am the granddaughter of William J. Honan: 302nd Infantry Regiment, 94th Infantry Division. I found this website, and a forum mentions my grandfather's name, there is so much information on the site, I don't really know where to start. Award of Distinguished Service Cross. From: "Eastes, Erick E Mr ARMY GUEST USA"
My father, Charles R. Eastes (also known ar Bob or Red), served with Company A., 319th Medical Bn. I am looking for photos of medics of the 94th, especially those photos taken in the field. These photos will be used primarily for educational purposes as I do give talks and presents displays about those who have served our country. I would be interested in original photos or electronic copies. If you have any that you would like to share with me, please contact me at Erick.E.Eastes@us.army.mil. It's been a while since I've posted on here. I'm hoping someone will see the photo of my Uncle Clarence and remember him. I'd also like to know more about the organization of L Company, 301st. For instance, Uncle Clarence was a machine gunner. 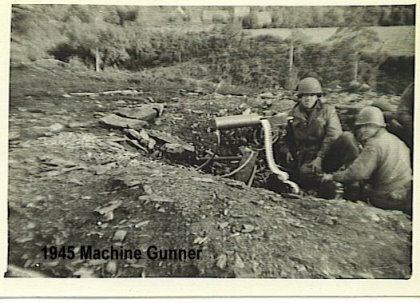 Were machine gunners assigned to a rifle squad or did they have their own? How many machine gunners would have been in L Company? her brother's grave in Europe several years ago. Is there any additional information you can give us about her brother? He is mentioned in the book Patton's Pawns. Sir, My sister & I are looking for anyone who may have served with my father in WW2. I know it is a long shot. He never spoke much about the war with us. He was in the 94th div. Co B 376 regt. We have just found some letters from him to his sister. My sister are the only ones in the family now. I have his ribbons & some info about battles he was in. I'm going to get them together with the hopes that it could help. Can you point us in the right direction. 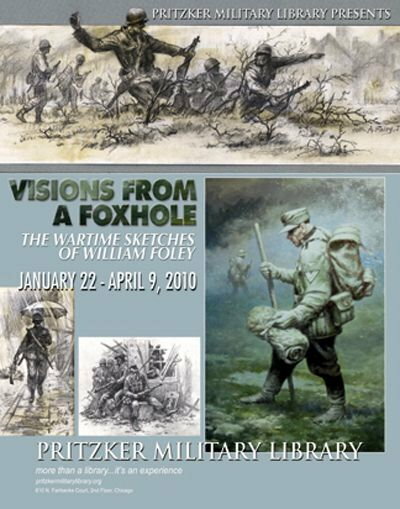 CHICAGO, IL – Visions from a Foxhole: the Wartime Sketches of William Foley will be on display at the Pritzker Military Library from January 22 to April 9, 2010. Admission is free Monday through Friday, 8:30 a.m. to 4:30 p.m., and also for Library members during scheduled evening events. This exhibit includes more than 40 works in pencil, ink, and oil. Many come from the sketchbook Foley carried as a young rifleman during the war; others show the reflections of a veteran over the decades after his service. A new oil painting, “The Trench on Hill 468”, will be unveiled as part of this exhibit. 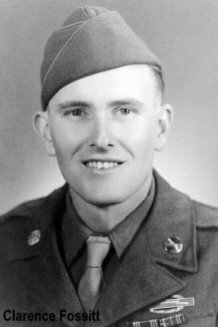 William A. Foley, Jr. served in Gen. George S. Patton’s “Ghost Corps”, joining the 94th Infantry Division as an eighteen year old in January 1945. The fall of the Third Reich was nearly within grasp, and Foley would see combat immediately. The 94th was assigned to break through the “Siegfried Line” in frigid northwest Europe, which was the key to Germany’s western defense. Over several weeks of nearly continuous combat against the vaunted 11th Panzer Division, the 94th pushed forward – over the Saar River, into the hills, and finally across the Rhine to Düsseldorf. Visions from a Foxhole evokes the scarred winter landscape of that campaign, from shattered cities and blackened forests to the trenches where Foley and his fellow soldiers dug in for battle. There are also a number of personal vignettes of life on the front lines, as soldiers catch a chicken for dinner, take prisoners, explore a soap factory, and stand watch by a wrecked farmhouse. For a time, though his memories of the war were vivid, Foley could only recreate them in black and white. In 2003, Foley completed a commemorative mural for the 94th Infantry Division at the state capitol of Massachusetts. His work has also been exhibited at the National World War II Museum in New Orleans, along with other museums and galleries. Now retired, he lives in Dallas. Sample art, advance viewings, and curated showings of this exhibit can be arranged upon request. For more information, please call (312) 587-0234 or email fieldtrips@pritzkermilitarylibrary.net. The Pritzker Military Library hosts regular exhibitions of military art and photography in its gallery, drawing from the work of visiting artists as well as a collection of more than 1100 posters and prints, and over 6,000 photographs and glass plate negatives. Past exhibitions have included artists such as James Dietz, Mort Künstler, Don Stivers, and Howard Chandler Christy. The Pritzker Military Library is a non-partisan, non-profit research institution located at 610 North Fairbanks Court in the Streeterville neighborhood of Chicago, near the Magnificent Mile. Admission is free and open to the public, Monday through Friday from 8:30 a.m. to 4:30 p.m., and also for scheduled evening events. Since opening in October 2003, the Pritzker Military Library has produced over 250 programs including events with award-winning authors, interviews with Medal of Honor recipients, and Emmy-nominated panel discussions on military issues. All programs are presented free of charge in front of a live audience, webcast live on the Internet, and recorded for later broadcast on WYCC-TV/Channel 20, a PBS affiliate. Programs are also available for download as audio podcasts. Winner of the 2009 National Medal for Museum and Library Service, the Pritzker Military Library features a collection of books and films on subjects covering the full spectrum of American military history, along with military-themed posters, photographs, medals, uniforms, and other artifacts from private donors and the collection of the Library’s founder, COL (IL) James N. Pritzker, ARNG (Ret.). I am interested in getting information about my fathers service. I understand that you might be able to help me get his service record. I wanted to know when and where he served. He never talked too much about it but I would like to be able to pass some of his history to his grand and great grand children. I would appreciate any help you could give me. His name was Ernest Mortz Pope. He passed away about 15 years ago. I can give you more information if you are the person who can help me. Thank you for keeping the 94th going. Please, don't throw that American flag into the trash! Do you have a old, frazzled flag that's no longer fit for display, that's laying around your office or home and you just don't know what to do with it? Then send it to us! We will properly dispose of it according to federal laws. Who are we? Visit our website at http://www.kitchentablegang.org for details about us and what we are doing to help veterans and our soldiers overseas, plus giving proper respect for ol'glory. The Kitchen Table Gang Trust will retire your tattered, worn out and frayed American flags with full honors! Anything else is desecration! Just send your flags to the not-for-profit Kitchen Table Gang Trust, 42922 Avenue 12, Madera, CA 93638-8866 and we'll dispose of your flags in a proper and dignified manner with full honors and dignity pursuant to the United States Flag Code Section 8K (PL93-344). The Kitchen Table Gang (formed over 16 years ago) is a "rag-tag" bunch of patriotic military types helping hospitalized veterans and our soldiers and Marines overseas with "Care" packages. Our flag retirement ceremonies are held on Flag Day, June 14th each year and are conducted by MGySgt Daniel Kelley USMC and an all volunteer military honor guard with Eagle Boy Scouts assisting. The Kitchen Table Gang Trust also has a nationally recognized educational program for our young people and students, teaching them the history, traditions and respect for our national emblem. When you send us a flag, please enclose a donation for this service which allows us to continue and expand our many patriotic programs. We do good things with your contributions (just ask any veteran or military service organization). We are located at the junction of Highway 41 and Avenue 12 just down from the world famous red, white, and blue barn (with the fifty golden stars on the roof) on the way to Yosemite National Park. Please, send us your flags!